Change has come to America with Barack Obama finally becoming president of United States of America. With new president, official website gets new makeover, features and contents. Homepage has subtle blue and white design with Barack Obama name and images. 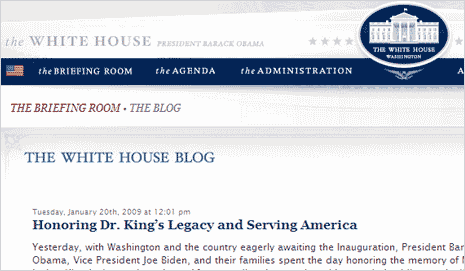 Official White House website now has brand new blog. Homepage prominently lists latest blog posts and like any other blog, you can subscribe to its RSS feed and access latest updates in your feed reader.